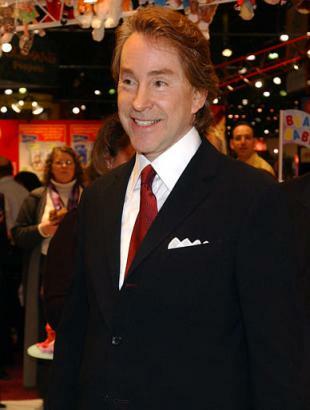 Ty Warner the mastermind behind Beanie Babies! Who is Ty Warner? Well there are very few facts known to the public about Ty Warner. He has been a relatively secretive man whose goals seem to include keeping himself out of the public spotlight 99.9% of the time. From the few interviews he has done over the past several years I was able to come up with the following about this mysterious man! Ty Warner was born September 3, 1944 (the year may be incorrect, as different sources have said different things over the years!) somewhere on the outskirts of Chicago, Illinois. His father's name was Harold, he was a jeweler and toy salesman. Ty Warner's mothers name was Georgia, she was a pianist. Ty also has one younger sister named Joy. In 1948 Ty and his family moved into the suburbs to a place called La Grange. La Grange was a small Victorian village about 1/2 hour west of Chicago. There they lived in a large villa that was originally designed by Frank Lloyd Wright. This same home was still owned by the Warners until 1996. From Kindergarten until Ty was 13 years old he attended Cossit School in La Grange where he was considered an average student. At the age of 14 Ty began attending Lyons High School in Chicago. Ty only spent three terms at Lyons before being moved to St. John's Military Academy. St. John's is a private boarding school for boys located in Delafield, Wisconsin. It has been said that his parents sent him there because Ty seemed to be unchallenged in school and lacked motivation to succeed. While at St. John's Ty became a member of the Star and Circles, which has been described as "an academic high-fliers club." Ty also participated in baseball, football, and basketball. This is all that is known about Ty's life at St. John's, Ty requested that the academy not provide anyone information pertaining to him. Can you blame him! After St. John's Academy, Ty began attending college at Kalamazoo College in Kalamazoo, Michigan where he studied Drama. Ty was only here a year before he dropped out to become a star. Ty decided to try his luck in Hollywood, California as an actor. However, about all he did in California was pump gas and sell cameras door to door. Once Ty realized that Hollywood was not going to work out for him he moved back to Chicago where he started his career in toys. Ty went to work selling plush animals for a San Francisco based toy company called Dakin in 1962. Here is where Ty's future began to take shape. How do you get people to buy something? This is a question Ty must have asked himself because Ty's idea of selling toys was this, - Driving a white Rolls-Royce convertible, arriving for appointments with retailers dressed very eccentrically, in a fur coat and top hat, while carrying a cane. Ty's theory was that even if people weren't initially interested in toys, they would at least approach him to see what this funny man was selling! Ty told People Magazine, 'I figured if I was eccentric-looking in Indiana, people would think, "What is he selling? Let's look in his case."' Whatever Ty did it must have worked! Ty learned a lot while working at Dakin and credits them for teaching him how the plush industry operates. Ty stayed with Dakin 18 years before leaving. There are two stories to why he stopped, one was that he was just burnt out and the other story claims he got fired for creating a competing toy line. Life after Dakin and before Ty, Inc.
Why rush a new career? Ty heads to Sorrento, Italy after leaving Dakin. Italy would be the inspiration Ty needed to start Ty, Inc. In Italy he discovered a nice range of soft, cute and cuddly plush cats (Ty must really like cats! ), Ty had never seen cats like these in the U.S. In 1983 Ty returned home to the U.S. where he placed a mortgage on a small flat he owned in Hinsdale (a suburb near Chicago), and used the $50,000 he inherited from the passing of his father in 1983, and used all of the savings he had from working at Dakin, where he made $ 100,000+ a year, to create Ty, Inc. Ty, Inc. was incorporated in 1986. In the beginning, Ty started shipping his plush cats from within his condo until his business got too large and the landlord got a bit upset that he was running a business from his home! One of Ty's first orders of business for Ty, Inc. was to hire some employees. Ty hired two workers Anne Nickels, spokeswoman, and Patricia Roche, Ty UK executive, both still work for the company today! Ty than travel to Korea to find someone to make his cats! The line to be produced was a plush set of Himalayan Cats similar to those he saw in Italy. There were ten cats total, they each had names like Angel, Peaches, George and Smoky. Each plush sold for about $20 retail, each cat was basically the same style with different colors, names and sizes. These began to sell out in local shops! Ty commented once about the names of plush saying, "Kids identify with names. In the beginning, I thought of the cute names. Now I take them into the office and everyone makes suggestions." Ty was able to make a market for his plush by initially selling them to his old Dakin retailers. Ty also successfully sold 30,000 plush at an Atlanta Toy Fair within one hour! 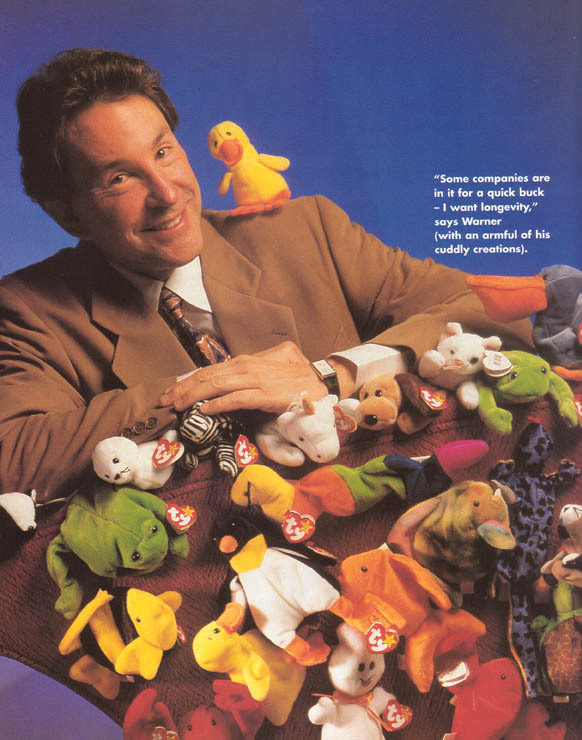 The Advancement of Ty, Inc.
By 1992 Ty's sales catalog had grown to several dozen animals. But Ty still haven't created what he had in mind, a small plush that would appeal to children, cheap enough that children could purchase them with their allowance money and fit them in their pockets. This thought lead to the production of the first Beanie Babies. 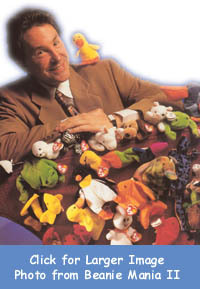 In early 1993 the first Beanie Baby was born, soon 9 Beanies to become known as the Original 9 are released, and shortly thereafter hundreds would follow to create one of the biggest fads in history! Beanie Babies! To read more about the Original 9 Beanies Click Here! 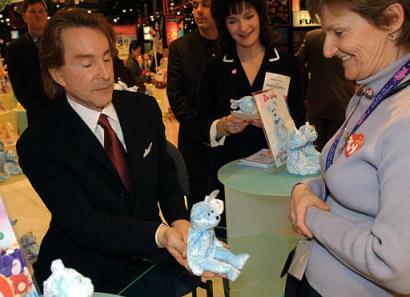 To follow what happen after the creation of Beanie Babies check out the Beanie Timeline Here! Ty, who is now a success, resides in a home in Oakbrook, Illinois, where the public eye almost never catches a glimpse of this mysterious man. Though Ty may be what some call a recluse, Ty has done many admirable things in the past. 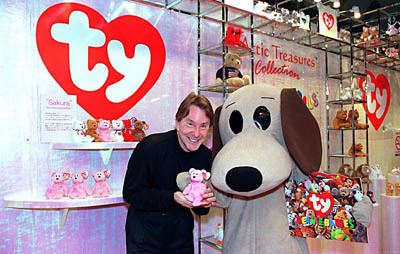 He has donated large sums of money to several well known charities, and created Beanie Babies for the sole purpose of generating money for a charity. Ty has been a generous man, he just happens to be a generous man who wishes to keep his life private. 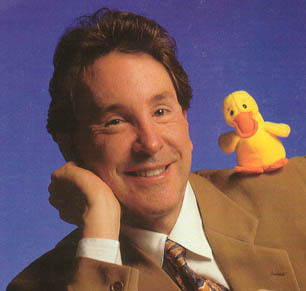 Little more is known about Ty Warner, but what enquiring minds would love to know! 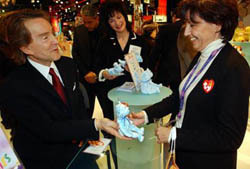 In the October 2001 Issue of Forbes Magazine there an article about Ty Warner! 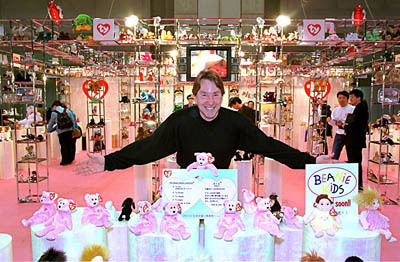 Here are some images of Ty from a 2000 Japan Toy Show. I did not take these pictures myself. I am not sure who did. 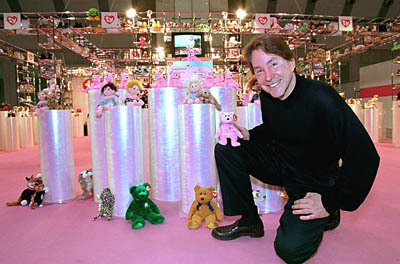 February 16, 2003 - Ty Warner personally signed 100 Decade Bears for retailers on the 2003 New York Toy Fair!